Relax in our garden with a big swimming-pool, take one of our bicycles to visit the nearby beaches of Jover or La Barranquera, go and surf in Bajamar or visit the spectacular Macizo de Anaga mountain range. Enjoy our free open-air breakfast and share our barbecue zone and get to know other guests and friends. These are just a few possibilities that Lagarto Backpackers offers you, we are your home in Tenerife! We have shared and private rooms, for your holidays with your family or friends! We are situated in a perfect location to experience the northern part of the island, just a few minutes away from the North Airport and the beautiful city of La Laguna, the most famous place for 'Spanish Movida' in Tenerife. > Fully equipped kitchen for our guest use. > Services, excursions and many activities. Payment by cash and credit cards. Please advise your aproximate time of arrival. Wonderful team working that will help you to feel like at home, and this is what it is!¡ unique location, amazing food prepared at nights, close to the best hikings, beaches around... the perfect place that will make you feel not to leave!¡ Best wishes. Very nice hostel in a quite area of the island. I highly recommend if you want to fully enjoy your experience in Tenerife. Staff is very friendly and happy to provide all the info necessary for a pleasant vacation. Just go for it!! 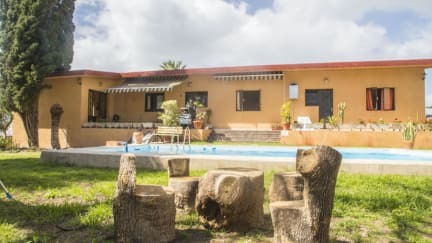 I woul definitely recommend the hostel to travellers who want to share their time with others, have fun and enjoy lovely evenings under the stars in Tenerife. I spent lovely 4 days in the hostel during which I met great people, we had dinners together (organised by the hostel); the staff was amazing, always super helpful and ready to give suggestions where to go and what to do :))) thank you, guys! I loved it and I will be back there when in Tenerife. This is not a hostel, this is pura vida y buena onda. Stay away from here if you don’t wanna know lovely people, eat delicious home cooked meals, have deep conversations whilst sharing music or beer, simply if you don’t wanna make the most out of your time in the north. Amazing place. Seriously. It felt like home since the first 2 minutes. 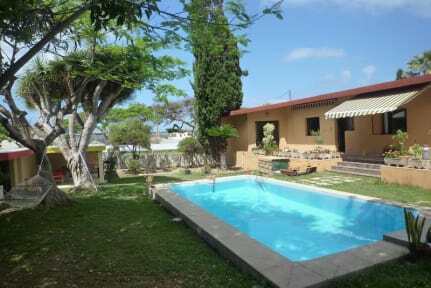 Convenient location close to both seaside and anaga mountains, but whatever you go here for the great positive energy not for the rational stuff! Grazie!!! I love Lagarto! Atmosphere-wise it was one of my best hostel experiences. The location has it pros and cons: it’s totally non-touristic (pro) but takes a while to reach if you depend on public transportation (con). I really enjoyed my stay, meeting other travellers, having amazing dinners, taking yoga classes in the morning and exploring the area with other guests. All the staff members were great. The small number of bathrooms caused some queues, but otherwise the facilities were good. Superb! Friendly staff and really nice vibe, perfect to relax! The place is beautiful, both the building and the surroundings, perhaps a bit far if you are not driving. We slept at the tent and it was amazing, so comfortable and silent. The crew was very concerned about our confort. I wish I had more time to spend there. The first worker we encountered, a guy with longer hair, was incredibly helpful. We didn't even ask for recommendations, and he recommended what turned out to be our favourite restaurant on the island: Altagay! Other than that, the place is alright. The crepes are good. I saw the staff cleaning every day, but the showers and bathrooms just didn't look clean. The location calls for a car. Staff is lovely. The ratings for this are NOT accurate. OK for a backpacker who need a bed.nothing more. It’s in the middle of no where, at least a 20 min drive from anything so u need car. U have to spend €€€ on taxis. Rooms and sheets are old. Felt very unsafe in the area. Front door is left open all night with no1 at desk. They make you dinner if you pay which is nice to hang w different people. Hostel for ALL AGES. There were elderly and babies around too. Spend more € and stay elsewhere.